Africa's farmland is rapidly becoming barren and incapable of sustaining the continent's already hungry population, according to a report. 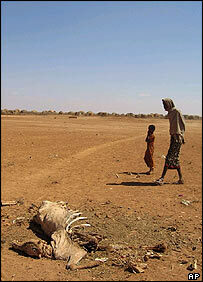 The report shows that more than 80% of the farmland in Sub-Saharan Africa is plagued by severe degradation. 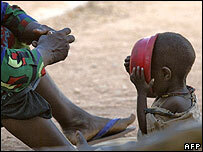 This is a major cause of poverty and hunger in sub-Saharan Africa, where one in three people is undernourished. Population growth is leading to the overexploitation of farmland, depleting soil of nutrients, the report says. Farmers' inability to afford fertiliser is a major contributing factor, it adds. Deforestation, use of marginal lands, and poor agricultural practices also play a role. The International Center for Soil Fertility and Agricultural Development (IFDC) report tracks soil health on the continent from 1980 to 2004. More than 60% of Africa's population is directly engaged in agriculture; but crop productivity has remained stagnant, while cereal yields in Asia have risen three-fold over the past four decades. "Farmers in Sub-Saharan Africa have traditionally cleared land, grown a few crops, then moved on to clear more land, leaving the land to regain fertility," the authors write in their report. "But population pressure now forces farmers to grow crop after crop, mining or depleting the soil of nutrients while giving nothing back." During the 2002-2004 cropping season, about 85% of African farmland had nutrient depletion rates of more than 30kg per hectare yearly. About 40% of farmland had nutrient depletion rates greater than 60kg per hectare yearly. In addition to removal by crop harvests, other factors contributing to nutrient depletion include loss of nitrogen and phosphorus through soil erosion by wind and water, and leaching of nitrogen and potassium. The highest rates of depletion are in Guinea, Congo, Angola, Rwanda, Burundi and Uganda. Fertiliser use in Africa is the lowest in the world, at less than 10% of the world average. African farmers are put off by high costs, the report says. It calls for policy and investment strategies to reverse nutrient depletion and restore soil fertility. These include making the use of mineral and organic fertilisers more economically attractive to farmers. A summit on the issue in June will look at lowering costs, training a rural network of retailers and expand financing for private importers exporters. The report says increasing productivity on African farms is critical to feeding a population that is expected to grow to 1.8 billion people by 2050.
Who's to blame for Africa hunger?